As a resident of east Guelph the question of WHEN comes up on a weekly basis. Some have been asking for 15 years. Others ask as part of their decision to buy here. Still others ask as they wait on their new home to close. Regardless, as I review the 2015-2017 proposed Capital Budget and reflect on this question, I’m encouraged. Encouraged because I can see the WHEN quickly converging with the NOW in East Guelph. 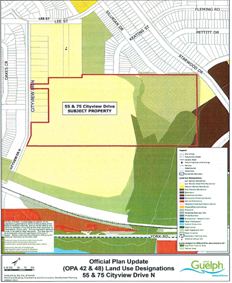 The proposed draft plan of subdivision for 55 and 75 Cityview Drive North includes the creation of lots and blocks to provide a total of 281 dwelling units, comprised of 111 single detached units, 32 semi-detached units, 19 on-street townhouse units, 71 cluster townhouse units and 48 apartment units. The draft plan also includes two new park blocks (1.17 ha in size) and 1 open space block (2.67 ha in size). The purpose of the proposed Zoning Amendment is to rezone the subject lands from the UR Zone and FL Zone to the R.1D Zone, R.1C Zone, R.1C-8 Zone, R.2 Zone, R.2-6 Zone, R.3B Zone, R.3A Zone, R.4A Zone, P.1 Zone and the P.2 Zone.